fancy dress for all ! XL, XXL, XXXL and XXXXL are in the ''full cut'' section of their web-site. Costume Discounters have plus size costumes to 3X for women and size 52 for men. With over 15K products to choose from, free exchanges, & same day shipping. They also offer an industry leading 120% price match guarantee. Their costumes look well finished, and well made. They've got a good range of atmosphere creating special effects, from lighting to fog machines too. Wholesale Halloween Costumes is the world's newest, and most exciting, costume and accessory etailer. 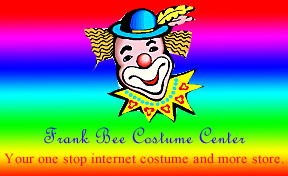 They claim to offer the same great costumes sold everywhere else at low wholesale prices all year-round with no membership fees. Big Costumes have everything in YOUR plus size for that fancy dress party, Halloween ball, New Year or Theme evening. Sizes you just don't get anywhere else. PLEASE READ EACH RETAILERS SIZE INFORMATION VERY CAREFULLY, AND DON'T JUST GO BY WHAT YOU NORMALLY WEAR.